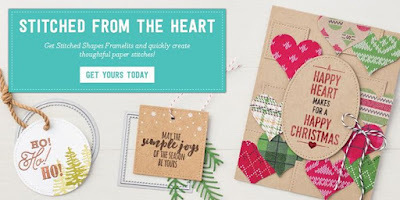 CraftyCarolineCreates: New Framelits and 25% of Stamp Sets - What's not to love?? New Framelits and 25% of Stamp Sets - What's not to love?? How is it November already? It feels two minute since it was the start of the summer and now the clocks have changed and the dark nights are back again! A little ray of sunshine however is the FANTASTIC offer Stampin' Up are launching today. Stitching effects on cards are so trendy right now and of course, Stampin' Up are always bang on trend so from today some fabulous new framelits are available to buy which cut out 3 different shapes in a range of sizes and apply a gorgeous stitched border. You can watch this (slightly cheesy) video to see them in a little bit more detail. SU wanted to bring these to their customers so quickly that we demos haven't even had a chance to get our hands on them yet! I've already ordered mine and will show you them close up as soon as I can. If exciting new framelits wasn't exciting enough, SU are also offering selected stamp sets which coordinate with these framelits with a fantastic 25% off! Wow indeed! f you would like to order any Stampin' Up products click HERE and head over to my online store or get in touch directly, it would be my pleasure and honour to help.